Four nevers? We hear you even across the Interwebs - "they must be mad or simply unskilled". Not so! 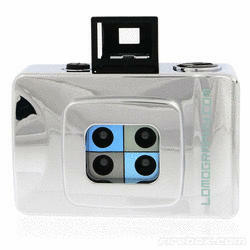 With the Lomo Actionsampler, four photos are your reward with just the press of a button. The idea here is that the Lomo Actionsampler - coming to FireBox at the end of the month - has four camera lenses instead of the standard one and with a single button press will take four independent shots of the same subject. Clever, right? It seems like it, and for around $40 US, a budding photographic artist or interested family member might just be able to capture a great many moments that have slipped by in the past. There are a few points to bear in mind before rushing off to order, however - the most important of which being that the camera is not digital. It uses standard 35mm film instead. The Actionsampler is small - only 3 inches wide - and has a shutter speed of 1/100 to let the four lenses grab four sequential photos in one frame. In addition, the camera doesn't need batteries and is fairly sturdy, so it can be easily carried around in a backpack or pocket. The operation is a cinch as well - one button press equals four photos - but there's no zoom or focus customization available. While samples of the work on the site look interesting, there's always the problem of what to do if your subject isn't moving, and site advocates either moving around or "jumping off a wall" to get the action going. While that would certainly be interesting, we're not convinced that a camera which requires the user to run around madly to get full effect is necessarily a wise investment. Still, there are many cases in which the Actionsampler could come in handy - during a car trip, at the pool or on a family vacation, but we do wonder if its lack of digital ability will hold it back from having its full, full, full, full potential.